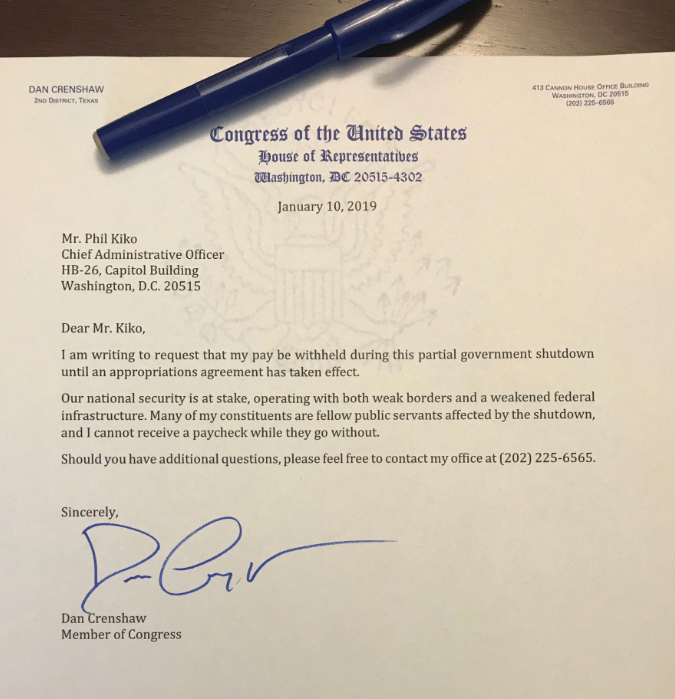 Texas Rep. Dan Crenshaw, a former Navy SEAL, has asked the government to withhold his paychecks until the partial shutdown is resolved and federal workers who are affected by the shutdown are able to be paid. He joins at least 70 other members of Congress who are refusing their paychecks since the government shut down on Dec. 22, 2018, the Washington Examiner reported Thursday. The partial government shutdown has now lasted for 21 days, a period tying for the longest lapse of federal funding in history, over President Donald Trump’s battle with Congressional Democrats over $5.7 billion in funding for a southern border wall. The shutdown enters its fourth week as hundreds of thousands of federal workers have now officially missed a paycheck. There are roughly 800,000 federal workers affected by the partial shutdown; 420,000 of those employees are working without pay while others are furloughed. “Our national security is at stake, operation with both weak borders and a weakened federal infrastructure. Many of my constituents are fellow public servants affected by the shutdown, and I cannot receive a paycheck while they go without,” he said. Crenshaw was injured and blinded in an IED explosion in Afghanistan in 2012. He was newly elected to Congress in 2018, and he entered the media spotlight after being mocked by an SNL comedian for his eye patch. Crenshaw later appeared on the show at the invitation of SNL; he was able to poke some fun back while also sending a powerful message to the public about veterans and forgiveness. This week, President Trump spoke to the American people from the Oval Office during primetime about the urgent need for a steel wall at the border with Mexico. Trump has said he might even declare a national emergency in order to build the southern border wall. The government remains partially shut down because Congress cannot pass a bipartisan appropriations act that would fund the entire government, a bill that Trump says must include nearly $6 billion to fund the border wall. Trump and Congressional Democrats remain in a standoff over the cost of the border wall – Trump wants one and won’t budge on his position, while Democrats refuse to fund a border wall. The main obstacle in garnering bipartisan approval for a federal appropriations bill has been the $5.7 billion Trump insists must be included for the construction of a border wall. The government has remained partially shut down since Dec. 22, 2018. In the meantime, hundreds of thousands of federal workers aren’t being paid, and many federal services aren’t being offered. The FDA isn’t offering some inspections, many national parks are closed, immigration courts aren’t open, and many museums are also closed.